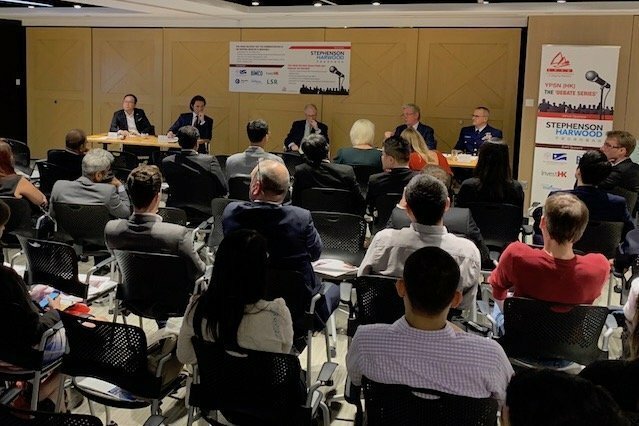 Impassioned debate on two contentious issues followed by cocktails high up among the skyscrapers served as a great curtain raiser on Friday to this week’s Hong Kong Maritime Week. The Young Professionals in Shipping Network (HK) organised two debates, both of which proved very close to call. The first saw Angad Banga, COO of the Caravel Group and Stephanie Leow, executive director of Standard Bank, argue that the commoditisation of shipping is inevitable. Their point of view was challenged by Frank Coles, CEO of Wallem and William Fairclough, a director at Wah Kwong and Mandarin Shipping. Caravel’s Banga argued that shipping is already commoditised, saying the price point is the key to deciding any major contract. His argument was bolstered by Leow, the banker, who observed that overcapacity in the capital markets meant most things had been commoditised. Coles took issue, suggesting that relationships were still the most important part of the business, while Fairclough pointed out that there were a lot of ships that simply could not get the right to bid on certain contracts especially in the larger sizes. One point everyone agreed on was that there is a big difference between the invested shipping market – ships – which is commoditised to an extent, and services where there is much more room for service level to dictate the price point. The debate was narrowly won by the commoditised believers. The event then moved to its second discussion, which questioned whether regulations only penalised the virtuous. Arguing that they did were Hing Chao, executive director at shipowner Wah Kwong and Wei Zhuang, regional manager at shipowning body Bimco. Chao made the case that that heavy-handed regulation does not work with the market and tends to produce uncertainty and chaos as witnessed by the impending IMO 2020 global sulphur cap. BIMCO’s Zhuang reinforced Chao’s argument saying that BIMCO prefers to work with owners to be self-regulating. Chao and Zhuang were on stage against John Ramage, COO of the Marshall Islands registry and rear admiral John Nadeau, assistant commandant for prevention policy at the US Coast Guard, who went on to eventually win the debate with Ramage saying, in essence, that not all owners can be trusted to self-regulate and heavy handed regulation gets the bad owners as well as the good. Nadeau acknowledged that authorities do get things wrong, but said, especially around the pollution story, regulators have to respond to public pressure, whether it makes them reasonable or not. The fact that the industry is much safer today speaks for itself, Nadeau and Ramage said, adding that if owners are unhappy they need to step up and play a more active and united role in being part of this process of creating regulations. Splash will be reporting from Hong Kong Maritime Week in the coming days. If anybody from CMA is reading this article, consider having a similar set-up at the CMA this year. It would be quite interesting to watch such a program during that event as well!